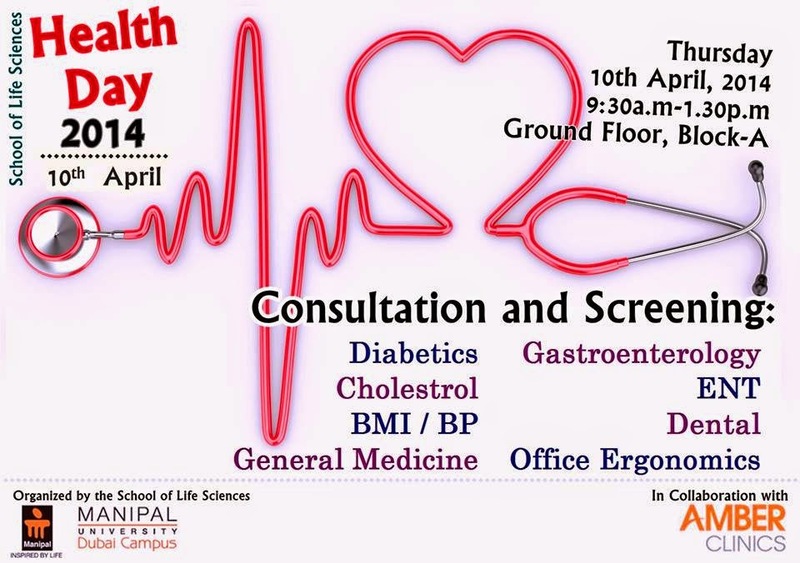 The School of Life Sciences organised a health camp on 10th April 2014 as part of the World Health Day celebration. The camp was open to all age groups and lasted from 9:30am to 1:30pm. The student initiative was supported by Amber Clinic, who provided medical help for the camp. Qualified doctors specializing in General medicine, ENT, Gastroenterology in Amber Clinic talked about the growing health issues among the youth as well as the staff. "Mostly among the faculty we have seen cholesterols on the higher side as well as higher blood pressures" said Soumya Eljo, Nurse in-charge at the Amber clinic, who was at the event. Doctors stressed on the fact that faculty required it more since outside the college, they have a busy schedule that gives no time for exercise. "Especially working females, when they go back home they are not able to spent time for exercise, after looking after the household works and all" said Dr Ranjana Charles, general practitioner at Amber clinic. She says a possible solution would be to extend the gym facilities to faculties, so that they too stay healthy. The common issue among the youth was overweight. "90% of the students are overweight and wanted to know how to lose weight," said Dr Ranjana. The expert advice to the students was to reduce junk food and exercise, at least for 5mins a day. Basic steps such as using the staircase instead of elevator etc is enough to maintain a healthy living. On a lighter note the doctors were happy to participate. All in all the camp proved to be a great learning experience for the students as well as the staff. When asked if they would like to visit next year, the doctors gave a hearty yes. The writer is a first year undergraduate student in the School of Media and Communication.